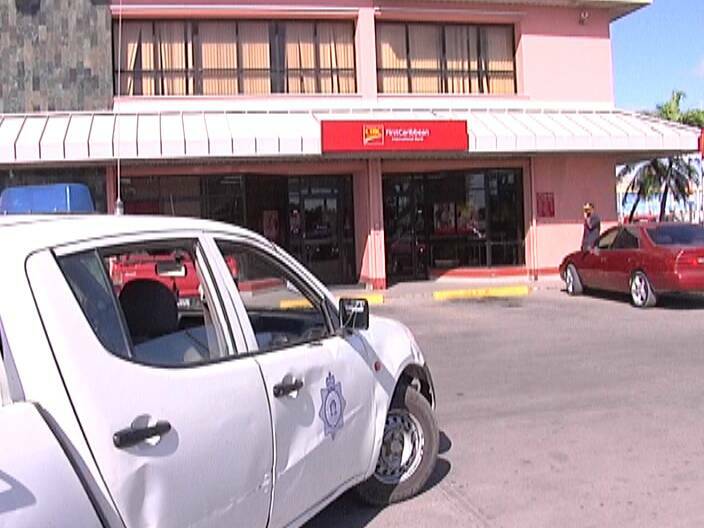 A major bank heist took place this morning at FirstCaribbean Bank at the Save-U Plaza. Four armed robbers in disguise eased themselves into the bank and held up the tellers. They fled with a reported two hundred and thirty thousand dollars from the banks vault in a getaway SUV. That part of the robbery appeared to have been executed according to plan, but the brazen robbers didn’t get too far because remarkable police response stopped them in their tracks. News Five’s Andrea Polanco reports. It was a bank job of bold proportion that could have been scripted by desperation or greed. But at eight forty five this morning a Honda Passport with license plate C-40714 pulled up to Save U Plaza with five men. Four of them exited. These four men dressed for the occasion. 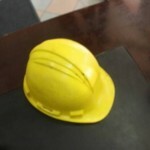 One of them was wearing a yellow hard hard hat. 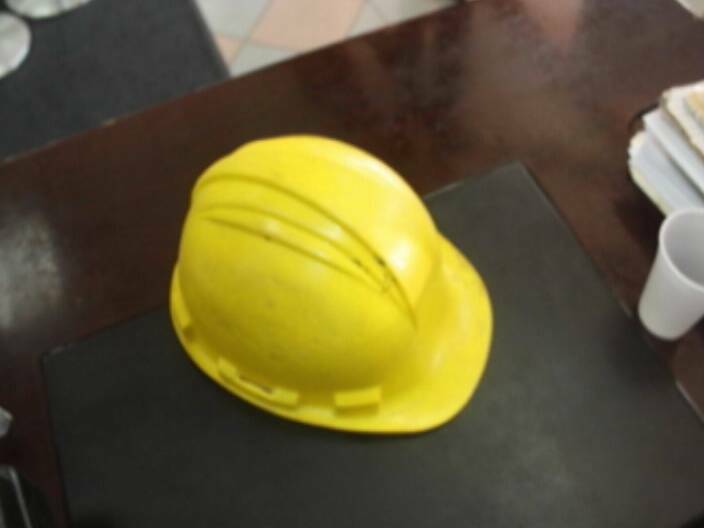 A construction worker was his disguise. One other man was wearing a reflective vest, a sign of another street worker. But these blue collar workers quickly transformed into stars of their own movie, in an albeit unedited and poorly written script. With guns blazing, they held up the tellers. Inside the black plastic bag and a small back-pack, they filled cash and contents from deposit slips. Two of the deposit slips that were emptied came from San Cas Plaza and San Cas Supermarket which had forty-six thousand six hundred and thirty-five dollars and sixty-six cents in only one slip. It was a flurry of activity as the open bank vault was empty of cash and Belize and U.S. currency were strewn on the ground in the chaos. 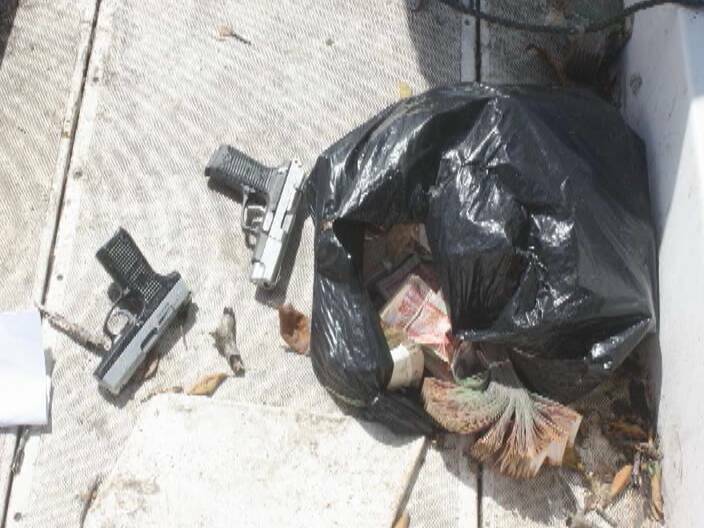 One of the robbers even dropped a magazine with several rounds inside it on the bank carpet. 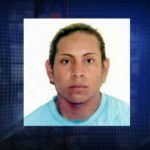 The man killed is twenty-year old Alberto Benito Assi. 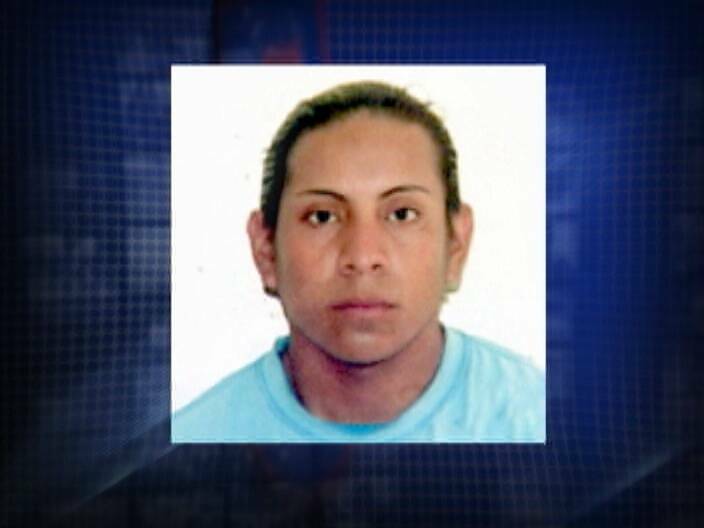 According to police, Assi was trying to escape but was killed during the gun shot exchange. These pictures show Assi fully clothed and stretched out on the ground behind a house on Lacroix Boulevard. He received two clean shots to the upper left and right of his back. 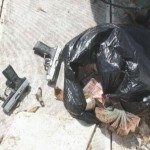 The cops retrieived the floating skiff, two firearms, and cash. La Croix Boulevard residents say that multiple shots were fired, some hitting their homes. And though there is little pity for a shooting bank robber, the guns were in the skiff. So were the shots to the back justified? Police are unable to say under whose name the impounded vehicle is licensed. They have since taken video from the surveillance cameras which they are using as part of their investigation to determine the identity of the other four men. Reporting for News Five, I’m Andrea Polanco. Kudos to the Police personnel and the public who participated collectively and quickly to pursue these suspects. While it is always sad whenever a life is lost, it is imperative that the police use justifiable force and harm to protect themselves and the public from these elements of terror. Dispite that the shots that the suspect received are in the back, does not mean that the suspect was not firing at police earlier. Whatever the case may be, they screwed up and broke the law! Whenever you make a decision to be invloved in the commision of a crime, you need to almost always assume that their will be consequences including your life. 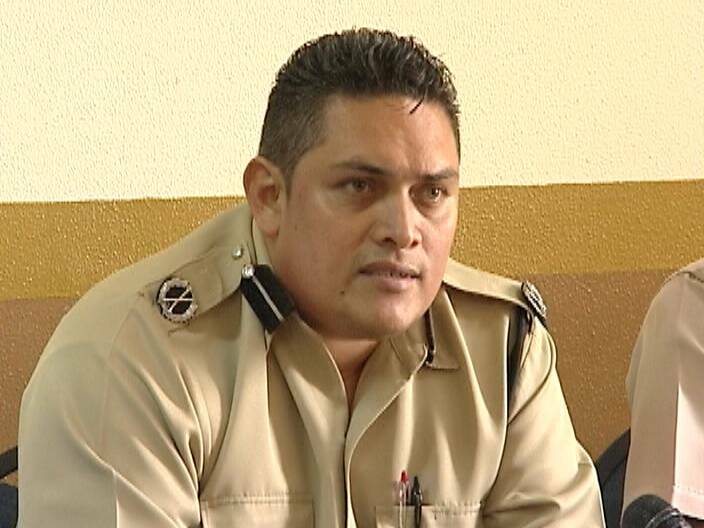 Once again, God bless my Belize Police who are always in the front line in the battle of safety for all Belizeans!! I would like to know this fellow nationality. 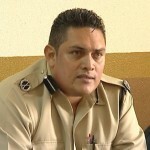 @Belize Police Department “Weapon handling rule # 2.”NEVER point your weapon on anything that you do not intent to shoot. Thanks to the police, good luck in capturing or killing the others. 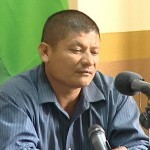 Stephen all you have to do is read the whole story; he is Belizean! I know what you are getting at and you could be correct because they did not say anything about nationality and how long has he been a Belizean. In any case the police did a dam good job and we shoud say so because when they do bad we all have much to say. So let them know when they did a good job too! I just read where they are questioning whether the guy should have been shot because the ploice already had the cash and the pistols! Now ain’t this crap? ……..! They fired on the cops as you wrote! When ever anyone shoots at the cop it is open season on them: period! So what the cop should have waited until he puklled another weapon from his waist band and turn to shoot at him and them it would be OK to shoot back? Is this crap or what? ………! 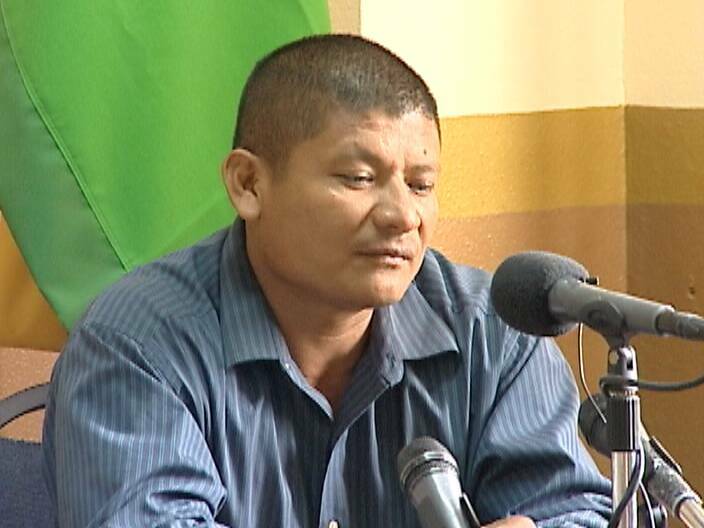 This guy is of Mayan descent, probably his parents are from the South.He attended Nazarene High School in Belize City for 2 years but dropped out. Good information Tanya…both you and Barack Obama on next story should apply for a job with the police. Kudos to our Police Department. Neighborhood residents in line of fire-blame the culprits who think they can use your yards as safe havens-not the police-it is the criminals that place you and your families in danger so corporate and say what you saw and who you saw and it won’t happen again. Thanks, but ONLY if the police KILLS the others, because they will strike again, and then they will be very well prepared !!! Give praise when its due and not only talk when things go wrong. KUDOS to our Police – it is a pity that the robber was killed as they probably could have gotten the others through him. That said … when your life is in danger, you protect yourself! 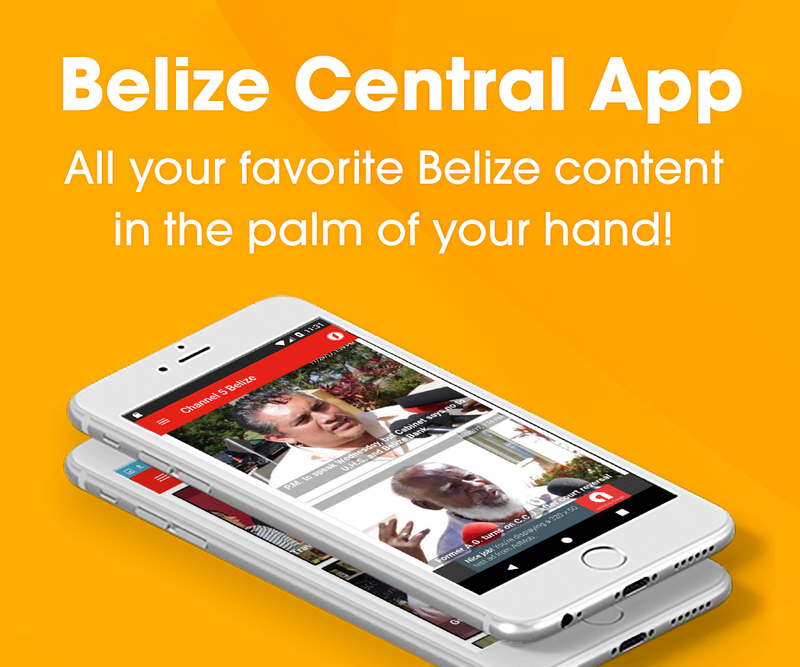 We need to take back our Belize … now we have to live in fear of being in a cross fire because of the lawlessness of these criminals. Good job officers! they planned to rob and went out like cowards,my condolences to his family,but when u think to rob a bank u got to be ready to die,why was his gun’s still loaded? and he was still taken out by a simple nine mm or a 38 revolver.he should have made some good family arrangements about his life that he might not come. AK 47 KEEP IT REAL BENITO ASSI. Will Assi ever do it again?job well done officers.Now find the others and give the same treatment. A job well done by both the public & the police officers! One down, three to go! no body have the right to kill a person and the police say that the shooting is justifiable ,so it is fair for the ploice to shoot a person in the back and say that is justice,just because they are suspect in a robbery,i agree that they did break the law and didn”T HE HAVE GUNSHOT TO THE CHEST instead of his back??????????????????? This system is so corrupted!!!!! the police had no right to kill that 20 year old guy!!! come on!!! they had already shot him in his leg where he couldnt move, why shoot him again to kiLL???? plus, the police department should invest in sending these idiots that running around with guns calling themselves POLICE back to the shooting range where they learn better to shoot at their aims instead of having the bullets going elsewhere almost hitting innocent people in their home with their kids!!!! then, their favorite line is when they kill someone innocent, IT WASNT ONE OF OUR MEN WHO FIRED AND WOUNDED THAT INNOCENT BI STANDER…. IT WAS SHOTS FIRED FROM THE CRIMINAL… right??? and one that i am glad for, Ricky Valencio isnt alive anymore or he would have been the 1st person they would go harrass and put the blame on for a crime he knows nothing about….. YOU POLICE MUST BE REALLY LOST RIGHT NOW…. RIGHT???? SO ARREST HIM!!!!!! HE IS PEACEFULLY RESTING AT THE NEW BURIAL SITE AT 13 MILES…. I KNOW U ALL WISH THAT HE WAS HERE SO U ALL CAN PUT THIS ROBBERY ON HIM….. LOL……. YOU GUYS ARE SO CORRUPTED!!!!! NOW YOU ALL SEE THAT THEY ARE PEOPLE OUT HERE WITH EITHER THE SAME MENATILY OR WORSE THAN THE GUY YOU PAINTED BLACK DAYS BEFORE…. SOLVE THIS CRIME NOW……………………..